Posted on Wed, Sep 22, 2010 : 5:31 a.m. Fans of NRBQ, this one’s for you. First, is your gig with The Incredible Casuals (every Sunday at the Beachcomber in Wellfleet, Mass.) finished for the season? Or do you keep it going all year? It runs through Labor Day, so it’s done now. We’ve done 30 years there on Sunday afternoons, which is quite a run. It’s a special crowd, and a magical place right on the ocean. We did our own version of it, a kind of a Byrds’ version, and then there’s an instrumental called “Boo-Da-Ba,” that was an old cover we revamped into our version, more rock and roll. It used to be more jazzy. Those are the only two we didn’t write on the album. Aside from that, Joey wrote stuff, I wrote stuff, we wrote stuff together. Who: Joey and Johnny Spampinato, Aaron Spade and Jay Cournoyer. What: Rock. The Spampinatos, of NRBQ fame, are on tour with their new band, which just released its debut CD. Where: Goodnite Gracie, 301 West Huron Street. When: 8 p.m. Saturday, Sept. 25. How much: $10. Info: www.liveandgracies.com, 734-623-1443..
What’s your sound like? It’s a mixture. Some stuff is bossa nova-like, some stuff is rock and roll, some is a little bit Beatle-y — some would say Italian Beatles. We’ve gotten good response so far from the (songs) I’ve sent out for promo, people have said they can’t stop playing it, which is a good sign. We’re proud of it. We really like the songs and we’ll be performing some of them on this trip. We’re hoping this will get us moving along. This is your first record together — how is your sound different from NRBQ, or is it? You’re always going to hear some of that NRBQ-esque type of structure in there, because we were that and we lived that. A lot of people look for that in our music, and they’ll hear that. They will hear some of the individual-ness in each of the songs — what Joey writes, what I write, what each of us write together. You can hear the chemistry. People that know NRBQ and the individuals in NRBQ that have come and gone know what each member can give. That’s an understood thing already by a lot of the fans. other than that, you’re going to get the individual-ness of each guy. You’ll be able to tell who’s on the album. Listen to Spampinato Brothers "Baby Oh Baby (I'll Believe It Too)" (MP3). Do you feel as if the new band needs to escape NRBQ’s shadow, or does that even matter? No, not at all. We were (NRBQ) for a lot of years of our lives, Joey specifically and a good 13 years for me. We don’t forget that, and some of the things we’ve done in that time. We wouldn’t want to get out of its way or try to avoid it or not give it any credit. On the contrary, we ‘re proud of what we did. We’re just moving forward the way we would, even if the band was together right now. We just look at it as more music. When it comes to being a live band and playing shows, nothing is going to be like NRBQ. We’re not trying to compete with it or anything, but we definitely feel like we can play good rock and roll and put a good show on. It will be up to the people to decide that, I guess. What’s it like playing with Joey in your own band, as opposed to NRBQ? It’s the same. We know what we have as chemistry and a combination together. With vocals, we know what songs are right for each one of us when we are writing something, what key to put it in and all that stuff. 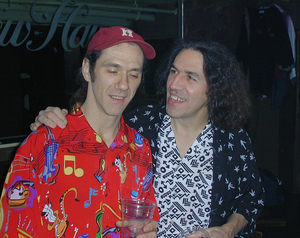 Joey and I have always had a lot fun playing together, starting from NRBQ, it was always something we enjoyed doing. My mom liked it too. Music was always around (growing up), and it was a big influence on me. I wouldn’t be doing this if it wasn’t for my brother doing it. NRBQ is famous for working without a set list. Do you guys wing it that way as well? A lot of bands write a set list and don’t go by them. Terry (NRBQ co-founder Terry Adams) always had a big list on stage, but didn’t really have a set list. He would go off on what he was in the mood to play next. So it is true it was an off-the-cuff situation, yet it was nice to see some songs on a list to remind you of what you could do. With us, I’ll write a set list and probably go with 80 to 90 percent of it. I’ll try to think about what’s going to be good for that night. NRBQ was also known for its high-energy live shows. Can we expect the same for the new band? Terry was the front man of NRBQ (and) he was a strong presence. Not having him on the stage obviously changes things quite a bit. We feel the things we are doing on stage sort of fit who we are. That’s probably the best way to put it. If you are talking about energy, there will be energy. It’s still rock and roll and we’re still playing pop music. But is it the same exact band? No, it’s not. But like I was saying, it’s the individual-ness you have to appreciate in a situation. It’s not a comparison, it’s a “do you like it or not” kind of a thing. Do you throw any of the NRBQ songs into the set? Yeah, we do. Don’t forget we did write some of them and we still like to play them and people still like to hear them. Definitely. What’s the chance of an NRBQ reunion? There’s no plan for anything right now. But I wouldn’t ever say it’s never going to happen. Music is really unpredictable and anything is possible. I always leave the door open in that way. With the Q you played in Ann Arbor a number of times. Anything you remember about the town? I remember the people being really friendly, and really laid back and really nice, the way a lot of Midwest towns are, a really village-y, cool place. I do remember there was an artist that painted, on the sidewalks close to the parking meters, two round circles and when the sun was right the shadow would show Mickey Mouse. Those are the kind of little things you remember about a city that makes it personable. And if I remember right, the town has good food. I’m sure it will be dÃ©jÃ vu when I get there. Is it too soon to ask about another Spampinato Brothers CD? I think this CD is going to get released in Japan, so we’ll probably give them an extra cut or two, so we’re probably going to go back into the studio and do that first. We probably will be working on the next album maybe near Christmas or after. Will there be a tour to Japan? Yeah, we’re talking about that in the spring. They usually want to get you over there if you release something. We’ve been over there a bunch of times, we know there are a lot of fans there. We’ve basically booked a bunch of shows out in the Midwest to start things off, and we just picked up a new booking agent, so we’re going to be a little more busy than we would have been without him. We’re glad to get out there again — we’ve got a lot of fans that haven’t seen us for a long time. Hmmm — isn’t all this touring is going to cut into your fishing time? I get it in once in a while. I run a bass fishing tournament (it’s) coming up in October, 30-40 people show up and the biggest fish takes the money. I do a little fly fishing, I catch stripers in the spring, but the last month I haven’t really been able to go. I am very due to get my waders on and get in the water. You need to get it in once in awhile, you come back a better guy. Wed, Sep 22, 2010 : 4:02 p.m.
Nice interview. I haven't been as excited about a show in Ann Arbor in a long, long time. Wed, Sep 22, 2010 : 10:12 a.m.